With the Cydia tweak Delete World you can delete a whole word to the left OR to the right of the cursor. The tweak also allows you to delete one letter to the right, and still be able to use the normal delete function. Delete whole word to the left by using a Shift + Delete shortcut. Delete whole word to the right by using a “123” + Delete shortcut. Delete one letter to the right by using a Space + Delete shortcut. Three different buttons which will replace the Delete button to show which deletion method is currently in use. Holding the delete button will continue deleting intervally using the same deletion method. If you are interested in the Delete World tweak you can find it through the BigBoss repo for a price of $1.00. Has it ever bugged you that when you swipe into the iOS spotlight page the keyboard always pops up? If this aspect of the iOS spotlight has bugged you, you will be glad to know that a tweak was recently released into Cydia to tweak the way the iOS spotlight works. Introducing No Keyboard SpotLight – A Cydia tweak which will very simply disable the keyboard from automatically popping up when you swipe over to the iOS spotlight page. If you are interested in the No Keyboard SpotLight tweak you can find it through the BigBoss repo for free. Has it ever bugged you that when you search for something in the iOS spotlight, your search results remain when you return to the iOS spotlight? If this aspect of the iOS spotlight has bugged you, you will be glad to know that a tweak was recently released into Cydia to tweak the way the iOS spotlight works. Introducing ClearSpotlight – A tweak which will automatically clear whatever was previously entered into the iOS spotlight without having to press the cross each time you want to search for something. 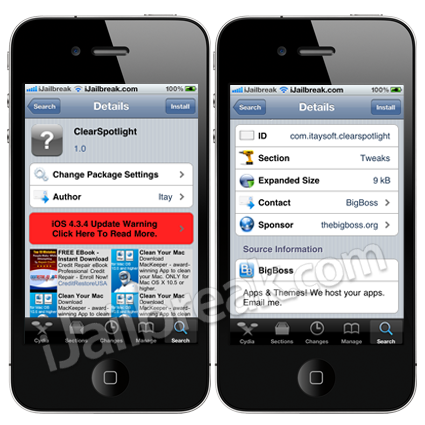 If you are interested in ClearSpotlight you can find it through the BigBoss repo for free. Has it ever annoyed you that the autofill entry list can become so bogged up that you constantly enter the wrong information when you go to compose an email, for example. Well if it has you will be glad to know a new Cydia application was recently released to allow users to clean up the email autofill entry list called AutoFill Eraser. The application will help users avoid seeing irrelevant email addresses from the autofill entry list when he/she composes an email. If you are interested in AutoFill Eraser you can find it through the BigBoss repo for free.